↑ ୧.୦ ୧.୧ Women's Gynecologic Health. Jones & Bartlett Publishers. 2011. p. 94. ISBN 9780763756376. 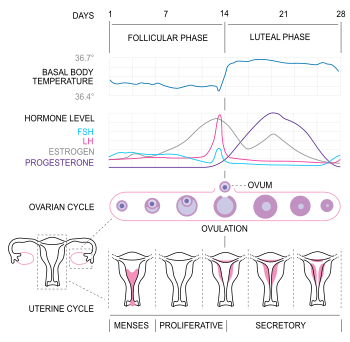 ↑ ୨.୦ ୨.୧ ୨.୨ ୨.୩ ୨.୪ ୨.୫ "Menstruation and the menstrual cycle fact sheet". Office of Women's Health. December 23, 2014. Retrieved 25 June 2015. ↑ ୩.୦ ୩.୧ Biggs, WS; Demuth, RH (15 October 2011). "Premenstrual syndrome and premenstrual dysphoric disorder". American family physician. 84 (8): 918–24. PMID 22010771. ↑ "Premenstrual syndrome (PMS) fact sheet". Office on Women's Health. December 23, 2014. Retrieved 23 June 2015. ↑ American Academy of Pediatrics Committee on, Adolescence; American College of Obstetricians and Gynecologists Committee on Adolescent Health, Care; Diaz, A; Laufer, MR; Breech, LL (November 2006). "Menstruation in girls and adolescents: using the menstrual cycle as a vital sign". Pediatrics. 118 (5): 2245–50. PMID 17079600. ↑ Kristin H. Lopez (2013). Human Reproductive Biology. Academic Press. p. 53. ISBN 9780123821850. ↑ "Menstruation and the Menstrual Cycle". Womenshealth.gov. November 2002. Archived from the original on 2 Mar 2007. Retrieved 11 June 2005. ↑ American Congress of Obstetricians and Gynecologists. "Menstruation in girls and adolescents: Using the menstrual cycle as a vital sign". ACOG. ↑ "Water retention: Relieve this premenstrual symptom". Mayo Clinic. Retrieved 20 September 2011.